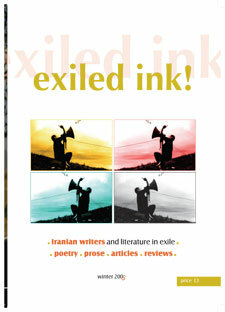 44 pages – includes a special feature on Iranian writers and literature with articles by Farideh Goldin and Hammed Shahidian and literature by Esmail Khoi, Reza Baraheni, Ziba Karbassi, Ali Abdolrezaie, Gazi Rabihavi and Shadab Vajdi. The general section contains newly translated poetry by Wafaa Abdul Razak as well as poetry by Yang Lian, an essay on translating Yang Lian’s poetry by Brian Holton, poetry by Bogdan Tiganov and Nora Nadjarian and an article on human rights in Turkey by Richard McKane. The seciton entitled New World Order includes poetry by Yuyutsu R.D. Sharma, Mir Mahfuz Ali and Dennis Evans and a prose piece by Soheila Ghodstinat. The reviews’ section includes reviews of The Silver Throat of the Moon edited by Jennifer Langer, Creativity in Exile edited by Michael Hanne, the poetry collection Reflecting on Reflections by Moises Castillo Florian, the novel Ghost Tide by Yoyo, Versions of Zimbabwe by R. Muponde and R. Primorac and of The Lake Fewa and a Horse by Yuyutsu R. Sharma. The magazine is beautifully illustrated.